So… exfoliating toners. Thanks to the epic rise of our very own Caroline Hirons to the position of Goddess-in-Chief of Skincare, exfoliating toners have seen a huge rise in popularity particularly among our little community. A couple of months back, Caroline gave my face a poke and a squeeze (and a slap – check out the instavid!) and declared my skin to be in good condition, but dehydrated. I knew this anyway, but what I didn’t know is that an exfoliating toner would allegedly help this no end. I’m pretty diligent when it comes to physical, scrubby exfoliation but I never really thought about introducing an exfoliating toner (which exfoliates with acid, rather than abrasive particles of something) to my routine. It just seemed superfluous to me, partly because I never really paid much attention to what their purpose is. I did some reading up after Caroline’s diagnosis though, and learned quite a bit. First and foremost, toners help to balance the skin’s pH levels – because cleansing your face will always interfere with these levels (which isn’t necessarily a bad thing as your skin will return to its normal levels in a matter of minutes, but toning speeds this up). They also exfoliate with the use of acids, AHAs in particular, stimulating cell renewal. They also offer a reasonable level of hydration and prepare the skin for more effective absorption of other products that you would follow up with, i.e. serums and moisturisers etc. After looking this up, it sounded like something I did in fact need to introduce to my routine but I wanted to try something quite gentle, with a slightly lower acid content than the likes of cult favourites Pixi Glow Tonic and the P50 Lotion. That’s where Clarins Gentle Exfoliator Brightening Toner* comes in – another product with the Hirons seal of approval which features the acid from the tamarind fruit as its key ingredient. The packaging says that this should only be applied 2-3 times a week, and comes with the legally required bumpf about not exposing your skin to the sun for a week after application – which would mean, if we actually lived in a country with decent weather (! ), that you would basically be on house arrest while this was in your routine but in reality, it’s perfectly safe. They just need to cover their asses. I’ve actually been using this nightly and have been absolutely fine, but my skin is generally pretty hardy. I suppose it’s always best to exercise caution if you’re not sure. Anyway, as instructed I sweep it over the skin and wait 60 seconds before continuing with oil/serum/moisturiser/other miscellany from my skincare drawer. Immediately, within the first few days of use, I noticed that I needed considerably less oil/serum/moisturiser after using this which supports the idea of toners priming the skin for better absorption. Theoretically, even though you’re paying for an extra product, this could well be a money-saver if it’s helping your other products to go further. In terms of visible results, I started to lose faith a little after 3 weeks without seeing a damn thing. It’s now been 6 weeks of daily use and I can’t honestly say I’m seeing any real difference. I am feeling a difference, though. Like I said, I’m needing to use less follow-up products as a result of this and I’m not feeling the need to have a manual, scrubby exfoliation so often either. To be honest I’m not sure what I really expected to see in terms of visible results if anything at all, and I’m happy with the Clarins toner overall and the knock-on effects its having with my usage of other products. That being said, I’m still not 100% sure whether or not I really need an exfoliating toner or whether it’s just a nice-to-have. What do you reckon? Do you use one, and if so, which? What effects has it had on your skin and your routine? 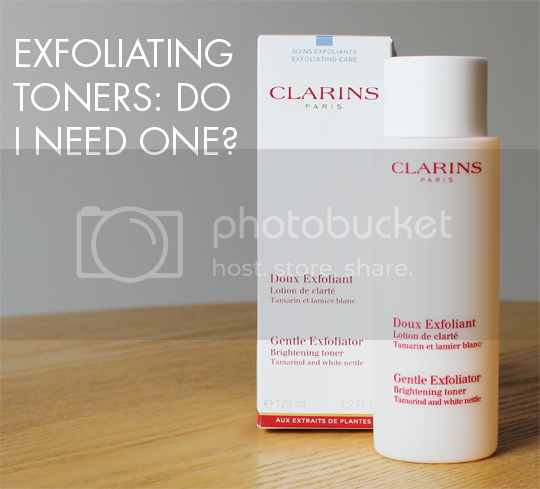 Clarins Gentle Exfoliator Brightening Toner costs £25 for 100ml (which will last forever since you only need a tiny drop each time) and can be found on counters nationwide and online.